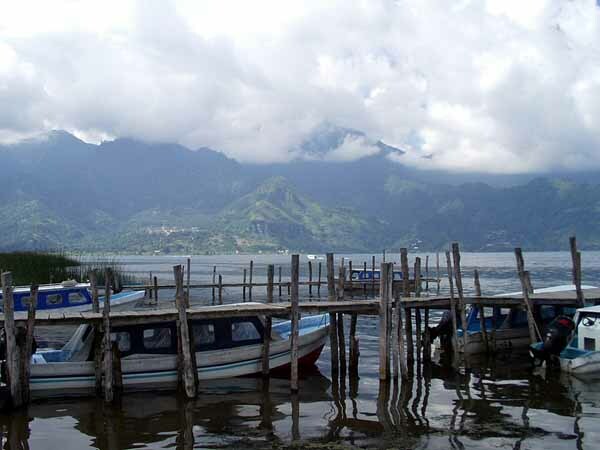 I left Antigua on September 12 for Panajachel on Lago de Atitlan, the Lake Atitlan in the news in October 2005 following the flooding and mud slides caused by Hurricane Stan. I took the local buses, sometimes called chicken buses, which are old U.S. school buses and usually packed beyond belief. They are cheap and go everywhere, but tough to take for long rides. 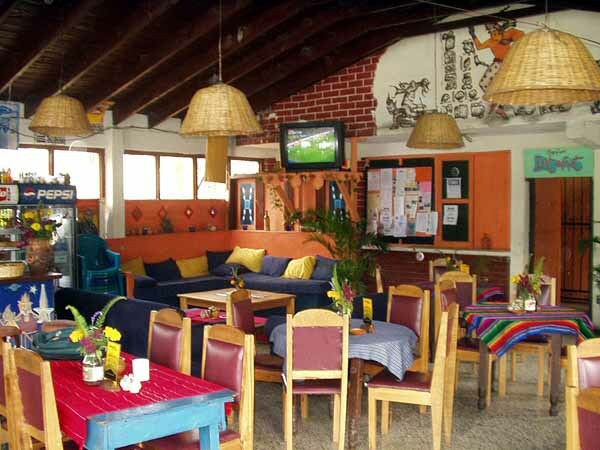 I got a 100 Quetzal room, about $12.50, in the Posada Monte Rosa in Panajachel. Panajachel is an interesting town. It used to be a hippy hang-out, but I think a lot of the hippies have returned to the U.S. to open "international" stores that mostly sell crafts and clothes from Guatemala. Now the town has a hippy/Mayan flea market feel to it. 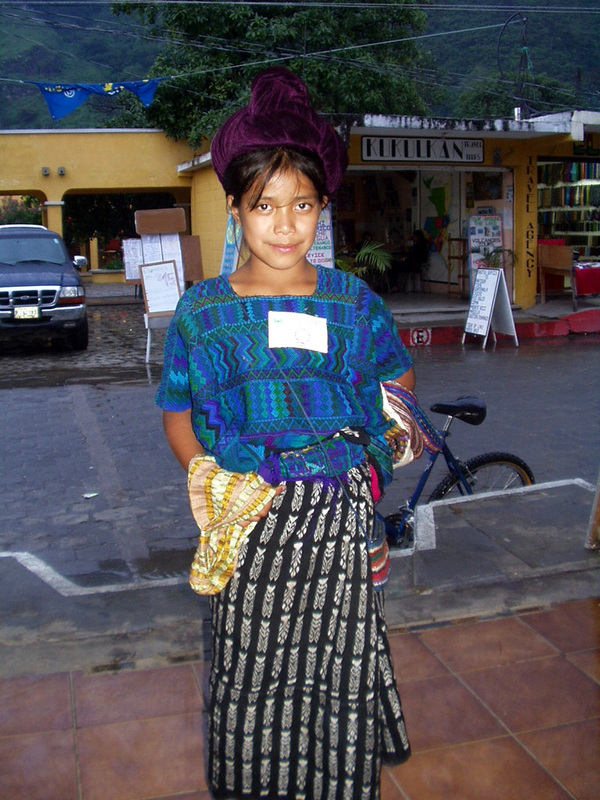 Panajachel also has lots of Mayan vendors, all women or children, prowling the main drag. I bought some souvenirs from them, always with the condition that I be allowed to take a picture. I had been cautioned against taking pictures of the Maya without permission; they sometimes get really angry about this. Almost all Guatemalans in this part of the country are Mayan. 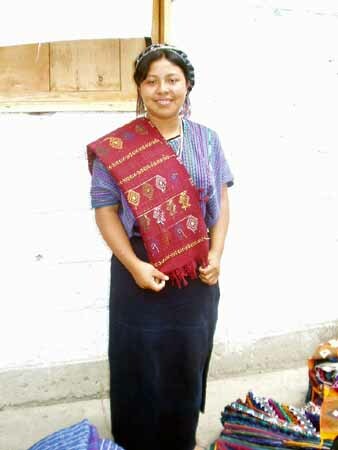 In fact in many parts of Guatemala and southern Mexico many people speak one of several indigenous languages as their first language and Spanish as their second. Many of the women wear traditional dress, the men almost all wear modern clothing. The men weren't nearly as photogenic. 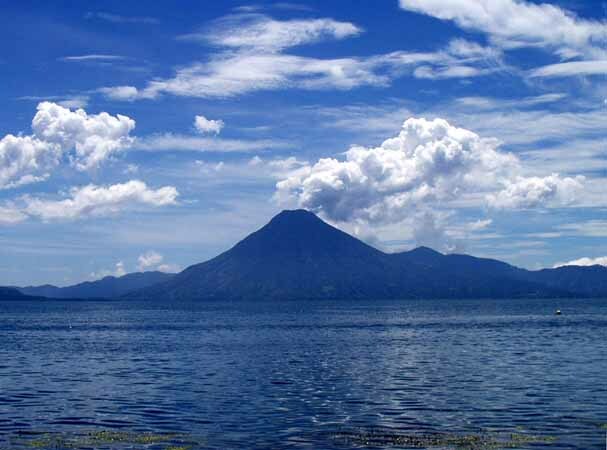 On September 17 I mailed a large bundle of souvenirs/oddball Christmas gifts to the U.S. and on September 18 I took a boat across Lake Atitlan to San Pedro La Sula. 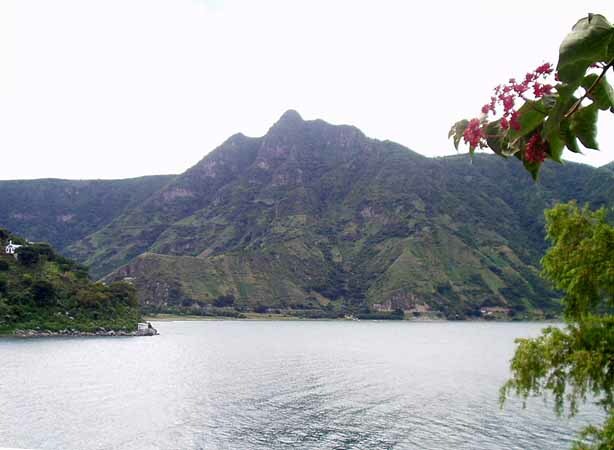 Panajachel is a good place for souvenir shopping and has modern conveniences like international shipping and ATM's, but a few days there is enough. 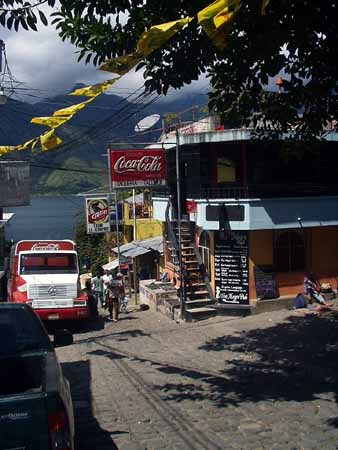 This is what San Pedro La Laguna looks like when you first arrive; a small dock at the start of a steep street leading into town. The first building is Nick's Place, which is a late night restaurant of last resort. 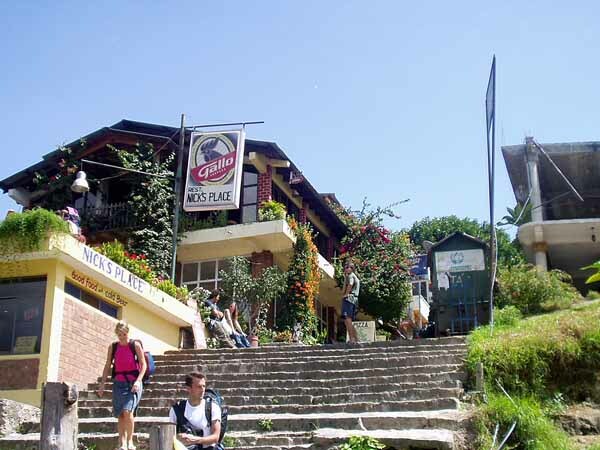 Just above Nick's place is D'Noz, and above D'Noz is Alegre Pub. More on them later. 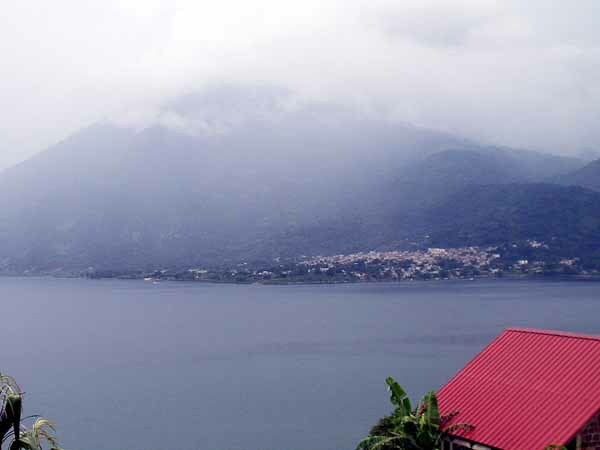 The second picture is from a short distance up the same street looking back at the lake. The stairs on the side of the corner building lead to Alegre Pub. 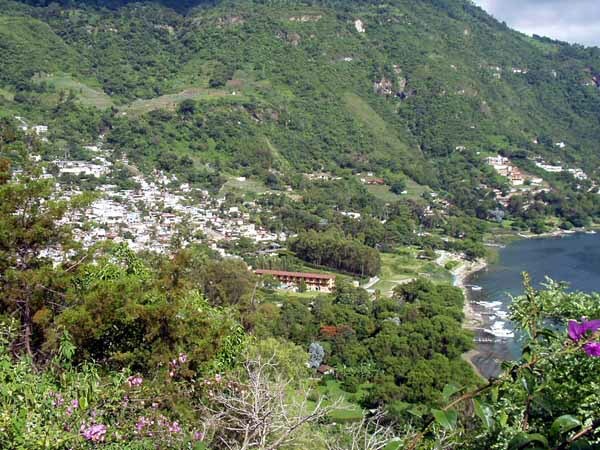 San Pedro is not exactly an undiscovered Mayan village, it has a strong ex-pat and backpacker presence there. 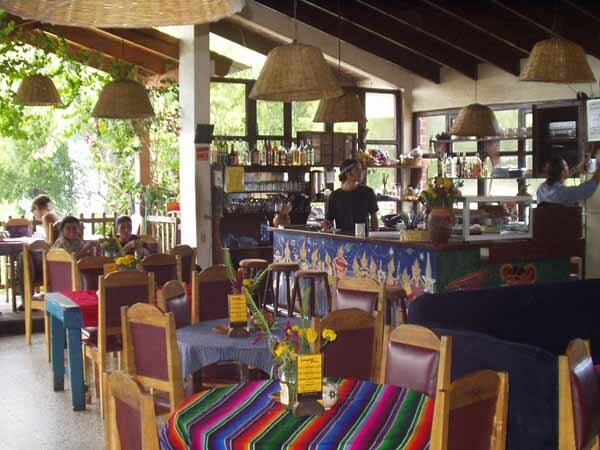 But it is a laid back place with nice views, scenic walks, good bars and restaurants and several Spanish schools. The ex-pats are mostly Europeans who run a number of restaurant/bars, the backpackers included a large Israeli contingent, who are good at locating low-cost, high-pot places. Many young Israelis go on a globe hopping backpacking tour after finishing their military commitment and cluster in inexpensive areas with recreational drugs. In the U.S. people usually get that out of their system in college, maybe that is not possible in Israel. 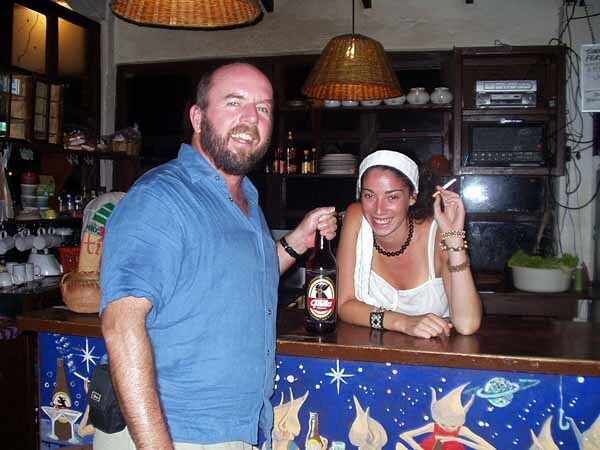 There were also European backpackers and Kate and Jane, two Arkansas college students who were supposedly in Guatemala doing research, but mostly seemed to be enjoying themselves while working at D'Noz. I think I was the second oldest gringo in town, the oldest was a Canadian hippy who would walk into bars and loudly ask "Does anyone here want to buy some pot?". 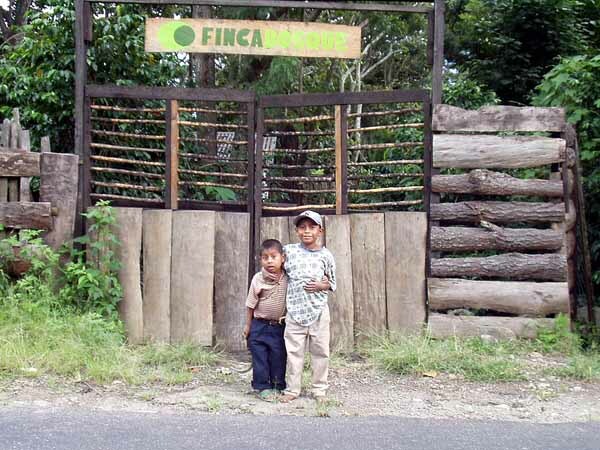 He was a permanent resident of San Pedro. I got a nice room for about $10 a night and stayed until October 24. I took refresher Spanish classes with Brenda, a local teacher. 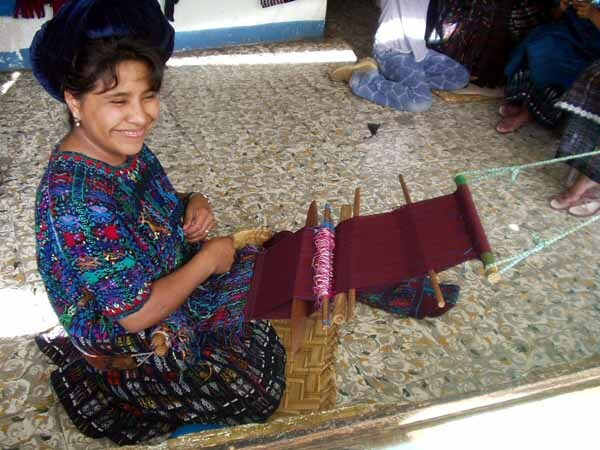 Unfortunately I didn't note her last name or the price for classes, but I'm pretty sure the classes cost 100 Quetzal, about $12.50, for two hours of individual instruction. Ten hours of individual instruction a week for a little over $60 is a bargain, and Brenda was an excellent instructor. She helped me relearn the Spanish I forgot while spending a summer speaking English on Roatan. My grammar and vocabulary improved significantly while taking lessons from her. If you are ever in San Pedro de Sula in need of Spanish instruction I recommend Brenda highly. She's easy to find; she and her husband have a one room school across the street from Cafe Arte. The first thing I did in San Pedro was catch a cold. 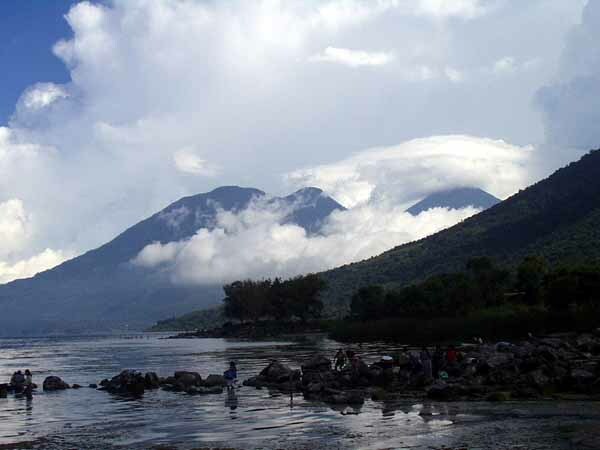 Lake Atitlan is high enough for mild weather even though the latitude is tropical, and September is rainy enough so it is impossible to avoid getting drenched. I rested, read, and established a routine that included a great deal of time at D'Noz and Cafe Alegre. D'Noz was run by Dean, a Dutchman who probably could have been making big bucks as a chef in Europe or the U.S., but he liked running his own place in Guatemala. 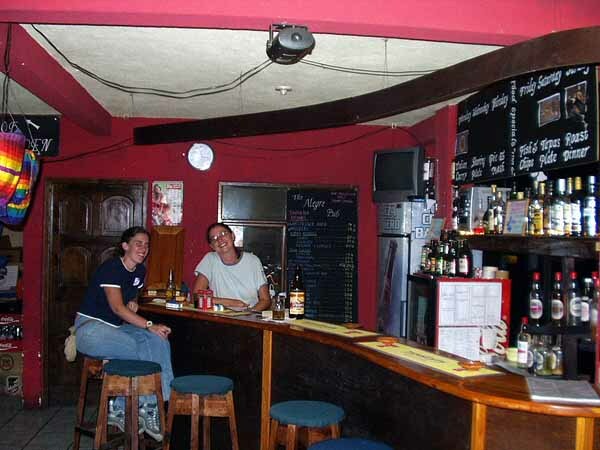 Cafe Alegre was run by an English couple, Matt and Dawn, who served traditional English food, such as curry. D'Noz had the better food and pretty bartenders, but Matt's place was friendlier. I did meet and talk with some of the local people; the United States is not held in high regard by everyone there. In the 1980's Ronald Reagan reversed Jimmy Carter's policy of making human rights a priority in international relations; Reagan's priority was anti-communism and he backed the military government of General Jose Efrain Rios Montt. There were confrontations over land between the Mayans who had lived on and farmed the land and the government that claimed to own it. The government would sell large parcels of land to businesses and expel the Maya who had lived on it for centuries. The Mayans resisted, the government called them communists (they may have been getting some support from the USSR, I don't know) and, cold war politics being what they were, the U.S. supported a brutal government that massacred thousands in a dirty war. 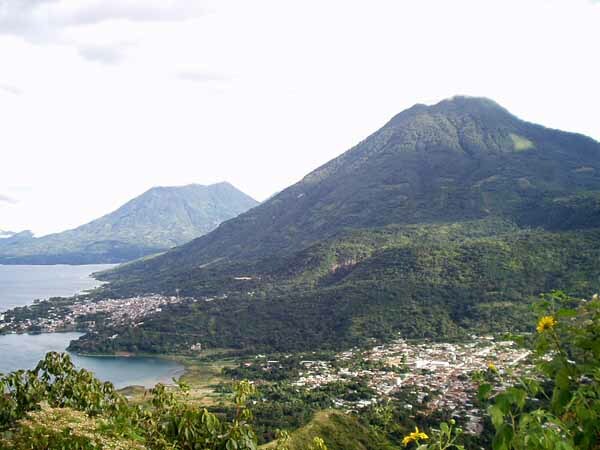 The Lake Atitlan region suffered a great deal during this period and to this day some of the locals refer to the U.S. as "Estados Maldidos". 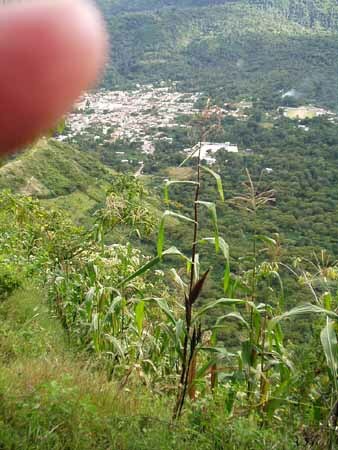 I only took a few pictures of San Pedro de Laguna during my five weeks there. 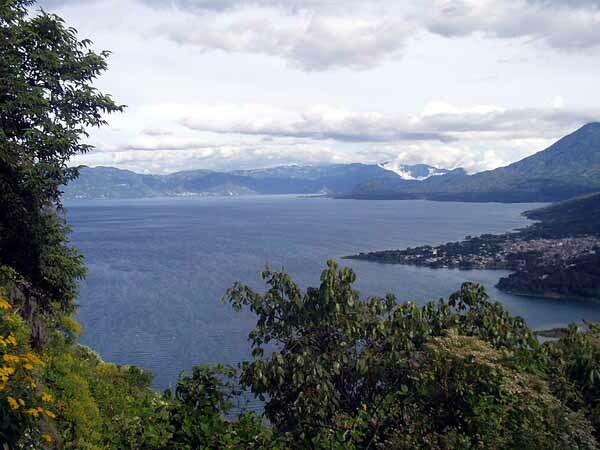 The first set are of Lake Atitlan seen from San Pedro, the taxi boats, and the rocks where women wash the clothes, not far from where lake water is pumped into tanks for the villages plumbing. 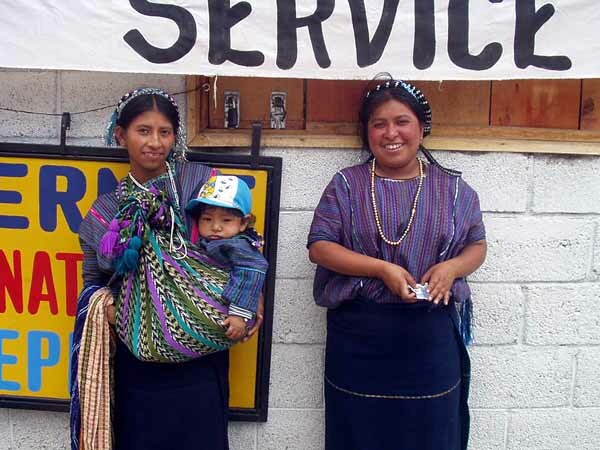 I didn't accomplish much beyond the Spanish classes during my five weeks in San Pedro, but I enjoyed mellowing out there, and I did need the refresher classes. On October 24 I finally got in gear and caught a series of chicken buses for a late arrival back to Antigua. I spent a couple of days checking out travel options to Flores. 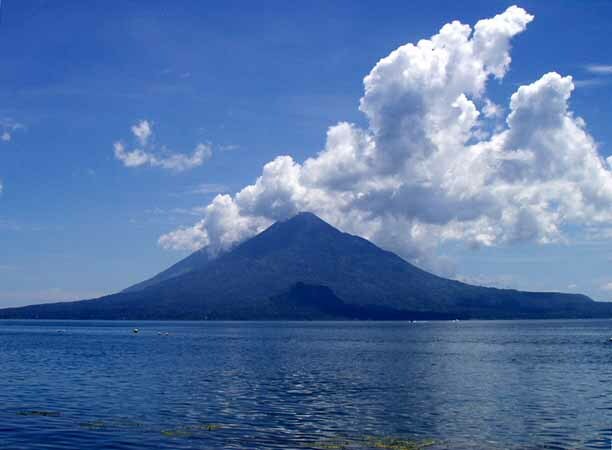 Early in the morning of October 27 I took a shuttle bus to Guatemala City where I switched to a first class bus (individual cushioned seats and air conditioning, very different from chicken buses) and arrived in Flores early that evening. Flores is the starting point for visiting Tikal.